David Russell Bell was born on November 15, 1928 in Louisville, Kentucky. The six foot left handed hitting Bell became known as Gus, in honor of Italian / American catcher Gus Mancusco. Gus Bell was signed by the Pittsburgh Pirates in 1947. He hit .325 at A ball Albany in 1949, followed by a huge start to his minor league season in 1950. He was batting over .400 with 6 HRs after 38 games when he got the call up to the big leagues. 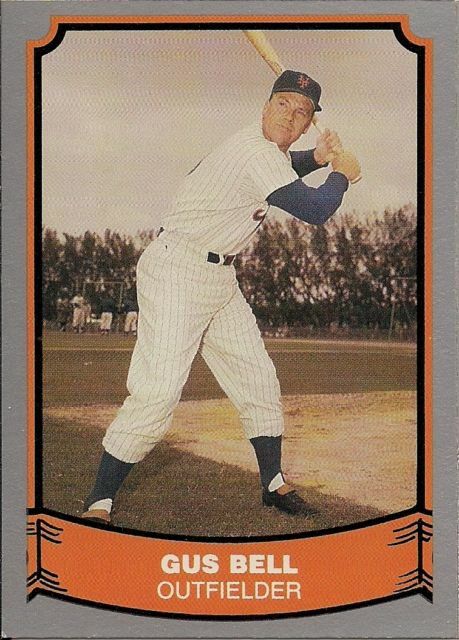 He batted behind Pirate slugger & future Mets announcer Ralph Kiner for three seasons. In his rookie year, Bell hit .282 with 8 HRs & 22 doubles. In 1951 he had his best season in Pittsburgh as he led the league in triples (12) hit 16 HRs & batted .278 while driving in 89 runs with a .330 on base %. On June 12th he hit for the cycle in the first game of a double header against the Philadelphia Phillies. 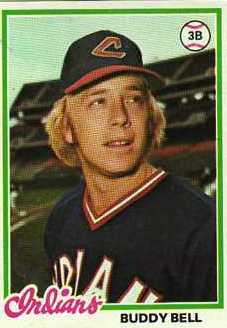 After the season he was sent to the Cincinnati Reds for Cal Abrams, Gil Henley & Joe Rossi. He was thrilled to return to his hometown area, near Louisville as a local star. He had some good seasons in nine years at Cincinnati playing in the shadows of Reds sluggers Ted Kuzewski & Frank Robinson. In Bell's first year in Cincinnati he had a career high 30 HRs (7th in the league) with 37 doubles (5th in the league) & 105 RBIs while batting .300 for the sixth place Reds. it was the first of three straight seasons he drove in over 100 runs. He would make his first two All Star games in 1953 & 1954. Bell would have three seasons where he hit 20 or more HRs, as well as four seasons with 100 plus RBIs, coming in the league’s top ten in both categories three times. Besides hitting .300 twice he hit over .290 four more times with the Reds, as well as having two 100 plus runs scored seasons. Gus Bell made four All Star teams and was one of the league’s top players during his years. He led all centerfielders in fielding % twice & when he played in right field he led right fielders in fielding twice as well. His arm got him double figures in assists eight times including a high of 18 in 1951. In 1955 he batted .308 with 188 hits (third in the league) with 27 HRs (10th in the NL) 30 doubles (5th in the NL) & 108 RBIs (10th in the NL) posting a .361 on base %. On May 26th, 1956 he hit HRs in three consecutive at bats in a game at Wrigley Field against the Chicago Cubs. That day Bell along with team mates Ted Kluzewski & Bob Thurman became just the second set of players from the same team, to hit three HRs in a single game. That day Bell had five hits with seven RBIs in the 10-4 win. 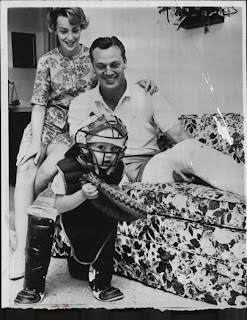 Later that year, on September 21st he drove in eight runs in a 14-5 win over the Milwaukee Braves. That day he gathered up four hits with a grand slam HR, a double & a walk. 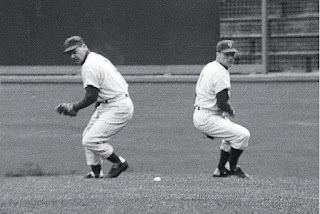 Bell made the 1956 All Star team, as the starting centerfielder going 0-1 in the NL's 7-3 win. In 1957 he was included with six other Reds players that made the All Star team. The Reds fans were accused of stuffing the ballot boxes illegally with their votes. 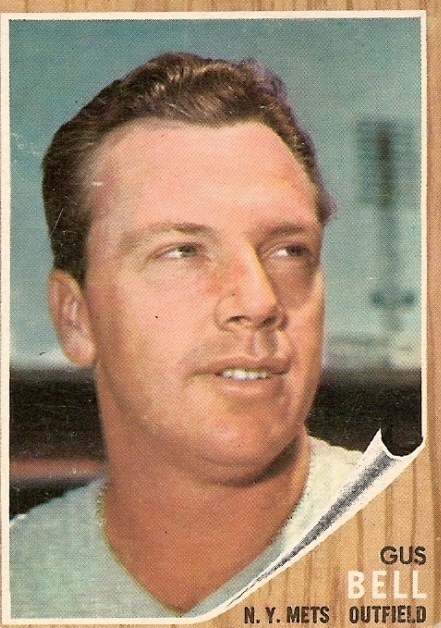 Bell remained on the All Star team as a reserve player, although his team mate Wally Post was removed completely from the roster. Bell entered the '57 All Star game as a pinch hitter for Frank Robinson in the 7th inning. He singled off future Hall of Fame pitcher Early Wynn, driving in Willie Mays and Ed Bailey in the 6-5 NL loss. Over the next few years his numbers fell off, although he did drive in 115 runs in 1959, his fourth season with over 100 plus RBIs. 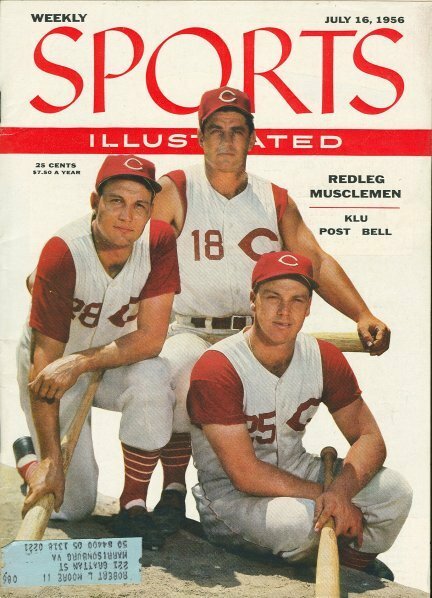 For the 1961 NL Champion Reds he played in 108 games, with 235 at bats as his career began to wind down at age 32. He hit .255 with 3 HRs 10 doubles & 33 RBIs as a back up to outfielders to Frank Robinson, Vada Pinson & Wally Post. Post Season: In the '61 World Series he went 0-3 as a pinch hitter. 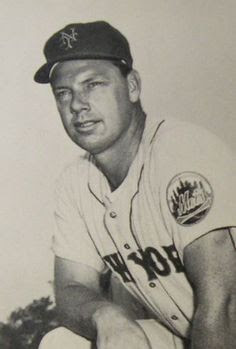 In the off season, although he was way past his prime, he was chosen as the eighth pick by the New York Mets in the 1961 expansion draft. He became an original Met, batting in the fifth position playing right field in the teams inaugural 1962 Opening Day lineup. He made Mets history getting the first franchise hit, a single in the 2nd inning at St. Louis, off pitcher Larry Jackson. On April 17, 1962 he hit his only Mets career HR, it came against the Houston Colt 45’s in the Polo Grounds. Bell would only play just 30 games in New York, batting only .149 (15-141) with 1 HR, two doubles, ten walks, & six RBIs while scoring eight runs. On May 21st, he was sent to the Milwaukee Braves as the player to be named later for Frank Thomas. He returned back to the Polo Grounds with the Braves in late June for a three game series. On June 20th in the first game of a double header, he hit a three run HR off Mets pitcher Ray Daviault, leading his team to the win. He finished his playing career in 1964 at age 35. Retirement: After 15 seasons he batted .281 with 1823 hits, 206 HRs, 311 doubles, 66 triples, a .330 on base % & 942 RBIs. In the outfield he posted a .985 fielding % with 57 assists (94th all time). 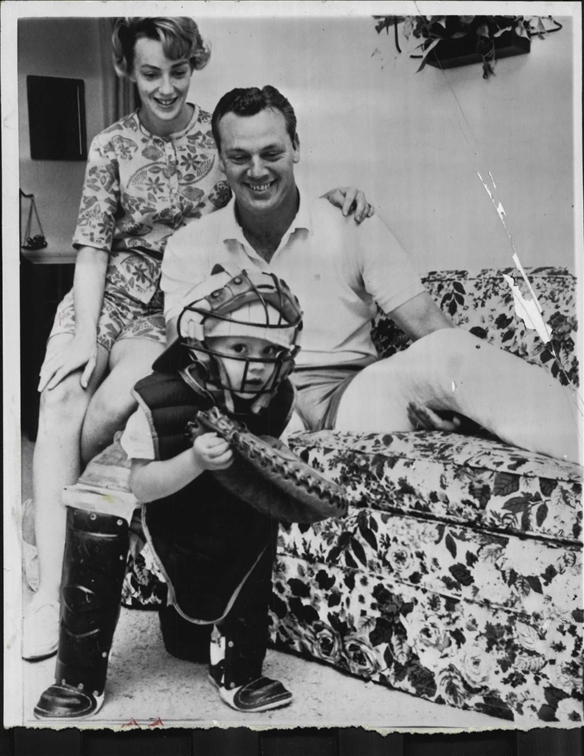 Family: Gus Bell is the first in a long line of family members to play baseball. His son is long time player & MLB manager Buddy Bell, who was born during his dads second season playing with the Pirates in Pittsburgh. 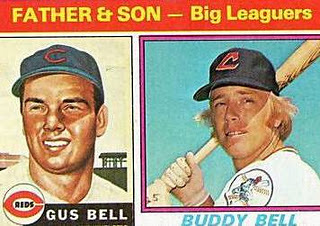 In 18 seasons Buddy Bell made five All Star Teams & won six Gold Gloves at third base. Buddy played for the Cleveland Indians as one of the teams few stars during a dreary era in Cleveland (1972-1978) Texas Rangers (1979-1985/ 1989) Cincinnati Reds under manger Pete Rose (1985-1988) & Houston Astros(1988). 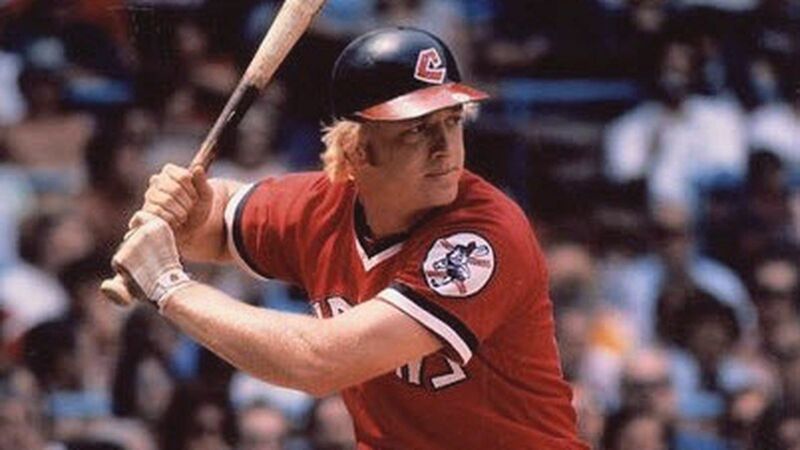 In 2405 career games (85th all time) Buddy Bell batted .279 with 2514 hits (99th all time) 201 HRs 425 doubles (145th all time) 56 triples 836 walks, 1151 runs scored & 1106 RBIs (208th all time) 80 sac flies (93rd all time) with 8995 at bats (75th all time) a .341 on base %. He played 2183 career games at third base (7th all time) winning six straight gold gloves, leading the league in fielding % three times, turning 430 career double plays (6th all time). After his playing career Buddy was a coach for both the Reds & Indians. He then managed the Detroit Tigers (1996-1998) & Kansas City Royals (2002-2007). Family: Gus Bell's grandson is former MLB infielder David Bell, who played 12 seasons with the Cleveland Indians (1995 / 1998) St. Louis Cards (1995-1998) Seattle Mariners (1998-2001) San Francisco Giants (2002) Philadelphia Phillies (2003-2006) & Milwaukee Brewers (2006) batting .257 with 123 HRs & 589 RBIs in 1403 games. He played in three post seasons getting to a World Series with the Giants in 2002. 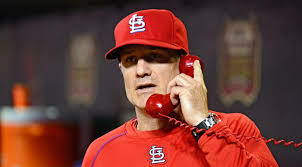 He has been the St. Louis Cardinals bench coach from 2015-2017. 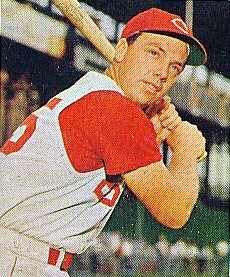 His other grandson Mike Bell played briefly (2000) with the Reds. Passing & Honors: Gus Bell passed away at age 67 in Montgomery, Ohio. Every year, the Gus Bell Celebrity Golf Tournament is held in his honor in the Cincinnati area. Proceeds benefit the Down Syndrome Association, his granddaughter Traci, to whom he was very close, suffers from Down Syndrome.